Jeffrey Dahmer (Ross Lynch) went on to commit horrific murders but that’s not the focus of biopic My Friend Dahmer. 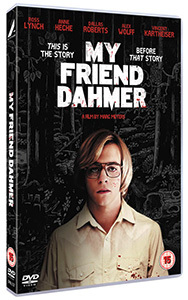 Based on the book of the same name by John ‘Derf’ Backderf, a childhood friend of Dahmer’s, the film explores the notorious serial killer as a teenager. Neglected by his parents and outcast buy his peers, Dahmer uses pranks as a way to gain some friends. When Derf (Alex Wolff) and his buddies start the Dahmer Fan Club, they encourage Dahmer’s oddball behaviour as a way to disrupt the high school they all attend. By all accounts My Friend Dahmer appears to have captured the reality of Dahmer’s teenage years. The killer is depicted as a sullen young man who spends his time collecting roadkill and experimenting on their remains. With his father Lionel (Dallas Roberts) largely absent and his mother Joyce (Anne Heche) battling mental illness, Dahmer is left mostly to his own devices. He is portrayed at the start of the film as having no friends, something his father expresses concern about, but when he pulls a prank in the school corridor, he finds himself suddenly popular. The way Dahmer is treated by his new ‘friends’ is quite appalling. They use him as a source of humour and in many ways their actions are an attempt to humiliate him. At one point one of the boys even says to the others that their actions aren’t right. As Dahmer continues to try and impress the group, he becomes fixated Dr. Matthews (Vincent Kartheiser) whom he regularly sees running. Dahmer’s sexuality isn’t really dwelled upon in this film but it is hinted at on several occasions. The biggest revelation about My Friend Dahmer is the performance of Ross Lynch. Best-known for the Disney series Austin & Ally, Lynch breaks out of the polished sheen of the House of Mouse. He’s gives a surprisingly layered performance as Dahmer, completely believable as an oddball and outcast. The way he glares at the camera, and the other characters, is unnerving and he really showcases a side of his acting we’ve never seen before. Anne Heche is also very good as Joyce, giving a very eccentric and erratic performance. My Friend Dahmer is an interesting look at the early years of the titular character. The film is very restrained and it only alludes to what the future holds for Dahmer. I did feel there were a few too many moments in the script that didn’t ring true where Dahmer’s friends started to suspect he may be more of an oddball than they first thought. That quibble aside, My Friend Dahmer is an interesting, if surprisingly straight-forward, look at one of America’s most notorious serial killers.